We need your help for our 2019 festival. The Big Anxiety is a major new biennial event in the Sydney cultural calendar happening right here at UNSW Art & Design. Launching on September 27 2019, The Big Anxiety will present a series of exciting projects and artworks for six weeks across a range of venues including UNSW Art & Design, Customs House, MCA, AGNSW, MAAS and in Western Sydney. Bringing together leading national and international artists; scientists and thinkers, visitors will experience immersive environments, exhibitions, performance, and interactive media events and conversations that talk about and re-imagine the state of mental health in the 21st century. Our festival vision is to create opportunities for meaningful encounters that increase curiosity and empathy, decrease stigma, support neurodiversity and promote psychological and emotional well-being in our society. Are you proactive and reliable? Open to new experiences? An excellent communicator? Interested in art, design, media arts, curatorial practice, performance, and public program? This is an exciting opportunity for anyone interested in or working/studying in the fields of contemporary art and/or the mental health space. The Big Anxiety is a festival of arts + science + people, and we welcome anyone interested in developing their skills and experience across a diverse range of areas. You will meet like-minded people, interact with new technologies, learn new skills, and engage with the general public about a broad range of contemporary ideas that span the art and science fields. You will gain an intimate behind-the-scenes understanding of how an arts festival operates, meet key thinkers, and work alongside participating artists on fascinating and thought-provoking projects. Do you need to fulfil work experience or volunteering as part of an educational requirement? The Big Anxiety offers comprehensive training across mental health and contemporary art fields. This is the perfect way to learn new skills while completing course requirements. We can tailor your Volunteer experience to ensure you are involved with projects that are relevant to your faculty. You’ll receive a written reference, meet new friends, and gain practical experience in all types of projects, exhibitions, and events while working in new and exciting environments. Volunteers play an essential role in making The Big Anxiety come to life. Through conversations and discussions, you will encourage audiences to learn and engage with a wide range of artworks and ideas; assist the public with directions and wayfinding; and ensure the safety of the work and audiences on site. On a typical shift you may find yourself assisting an artist with a live performance; you might be handling VR headsets; participating in a workshop or talk; or guiding audiences through an exhibition. Should you be hoping to learn other skills, there are opportunities to gain install, marketing, programming or administrative experience too. The festival runs between 27 September – 3 November 2019 and volunteers must be able to commit to a number of half-day shifts during this time. A typical shift will run for 4 hours. You will also need to be available to attend compulsory training sessions at the UNSW Art & Design campus. This covers project and venue inductions based on your preferences. 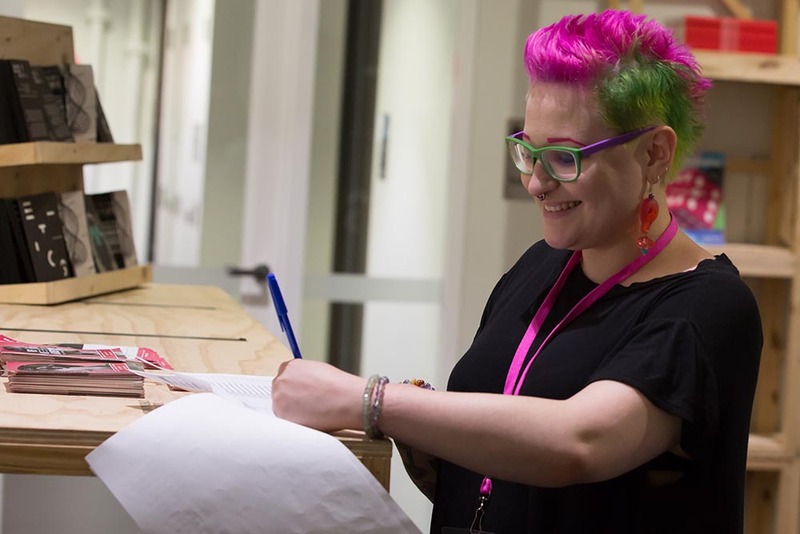 Volunteers will work across our key venues at UNSW Galleries, Paddington; Customs House, MAAS, AGNSW, MCA and in Parramatta (Operating dates and times vary per space – you can indicate your preferences in the Volunteer Application form). We are a small team with a supportive and accessible-friendly workplace. The Big Anxiety strongly encourages people with lived experience relating to mental health and/or neurodiversity to apply.